How do you see 20 plays in two days? For one thing, the plays all have to be little short guys. For another, you have to be lucky with your timing. The stars aligned in just such a fortuitous way this past weekend, when two local companies mounted entries in their annual one-act play productions — Island Theatre‘s Ten-Minute Play Festival had its fifth renewal Aug. 19 and 20 at Bainbridge Performing Arts, and Changing Scene Theatre Northwest trundled out the 14th edition of its “Summerplay” festival Aug. 20 at the Tacoma Musical Playhouse. The Ten-Minute Play Festival, a survey of the best submissions from Bainbridge Island and Kitsap playwrights, wrapped up its three-performance run — all shows either sold out or nearly so — Aug. 20. “Summerplay: A Festival of New Works” continued its four-performance skein with an Aug. 21 matinee, and offers two more performances (7:30 p.m. Aug. 27, 2 p.m. Aug. 28) in the spacious TMP, formerly the Narrows Theatre at 7116 Sixth Ave.
At 10 plays each, seeing the opening night performance of each, that was 20 plays in a little big more than 26 hours. 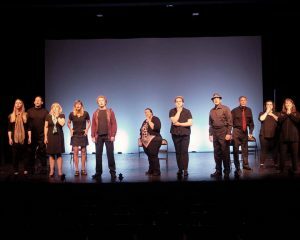 If you’re planning on heading across the Narrows Bridge to see one of the remaining “Summperplay” performances, keep in mind that the selected shows (from more than 100 submissions from the proverbial Far and Wide) are a wildly mixed bag, both in terms of writing quality and the acting involved. The beauty of such collections is that short plays are like city buses. If you miss out on one, there’ll be another along in a few minutes. Execution is key to “Summerplay’s” rendering of “Our Ten,” which began as a jumble of radio announcements and dial-spinning static, then took us inside the cars of some of those who find themselves directly affected by the news story playing out. Lighting (by Branden Wilson and co-director Pavlina Morris) and sound (effects by Darren Hembd, who co-designed with Morris and the other co-director, Karen Hauser), both were well done, supporting Levine’s solid, thought-provoking storytelling. Gibson’s sweet little sibling revelry “Meanwhile in the Backseat,” on the other hand, is more actor-driven, and Tacoma teens Skye Gibbs and Sean Kilen both do admirable jobs of bringing their characters’ “are we there yet?” interactions to life. The spartan settings and uneven acting in “Summerplay’s” other offerings are no big detraction; the problems I had with much of the material was that it seemed puffed and padded. Many of the plays took much longer to get to their points — when, indeed, they seemed to have a point — than they should have. Still, there was much to intrigue and entertain in the playwrights’ various methods and madnesses, and the first human-to-goldfish dialogue I can remember seeing, anywhere. As often as not, I found myself thinking that I’d seen the plots and premises in the Ten-Minute collection before, and that the plays seemed like variations or rehashes; competently rendered, but derivative. And some of the shows might’ve gone well longer than their allotted 10 minutes, or at least seemed to. That sounds cranky, but it’s not. The Ten-Minute Festival, like “Summerplay,” is an afternoon or evening of ideas, both in the scripts and the mounting of the plays. You’re not going to like everything you see, but you are liable to learn something, or walk away thinking about what you might’ve done differently. We used to be able to see “Summerplay” in Bremerton. But at least it’s still alive and kickin’, in what seems to be a mutually agreeable arrangement with TMP. Because you just can’t get enough short plays. Says the guy who saw 20 in two days. 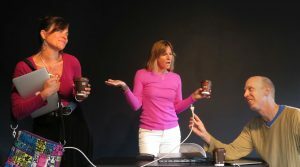 Photos — Top: Danna Brumley, Jennifer Jett and Bob Downing rehearse Wendy Wallace’s “Plugged In” for the Ten-Minute Play Festival. Bottom: The cast of “Summerplay’s” “Our Ten,” by Mark Harvey Levine, rehearse on the Tacoma Musical Playhouse stage. Island Theatre will perform staged play reading of “Copenhagen,” by Michael Frayn, at the Bainbridge Island branch of Kitsap Regional Library, 1270 Madison Avenue N. at 7:30 p.m. on October 17 and 18. According to a release, the Tony Award-winning play dramatizes the disastrous secret 1941 meeting between German physicist Werner Heisenberg and his former colleague and friend, Danish physicist Nils Bohr, on the Nazis’ efforts to produce the atomic bomb. Their work together on quantum mechanics and the uncertainty principle had revolutionized atomic physics. But now the world had changed and the two men are on opposite sides in a world war. Why Heisenberg went to Copenhagen and what he wanted to say to Bohr are questions that have vexed historians ever since. In Frayn’s play, Heisenberg and Bohr meet once again to discuss the intricacies of physics and to ponder the metaphysical—the very essence of human motivation—as well as the creation of the most destructive weapon of war known to humanity. Copenhagen is recommended for high school age and up. Admission is free, but donations will be accepted. 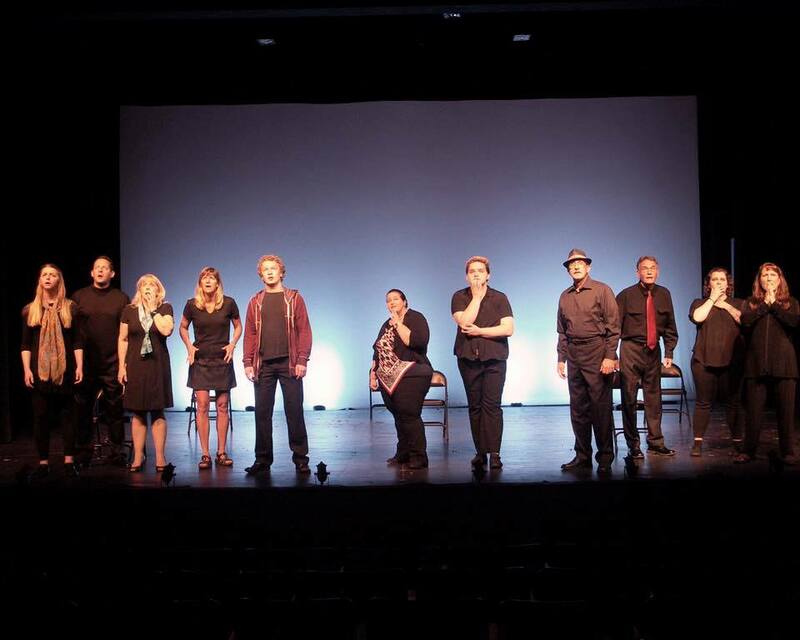 Island Theatre has announced the selections for this summer’s edition of their Ten-Minute Play Festival, which will be performed on Aug. 21 and 22 at Bainbridge Performing Arts. Each of this year’s nine selected plays (scored by a panel of judges) will be performed both days. The top play will be determined by judges following the two performances, and the winning playwright will receive a cash prize. This year’s selections (in alphabetical order): “A Cruise at Sunset,” by John Ratterman; “Ferblunjit,” by Karen Polinsky; “Hospice: A Love Story,” by Elizabeth Coplan; “Me and My Shadow,” by Steve Palay; “My Beautiful Voyage,” by Paul Lewis; “Second Chance,” by Bob Burke; “The Play’s the Thing,” by Jeff Fraga; “The Service,” by Wendy Wallace; and “Tree For All,” by Noah Barfield.